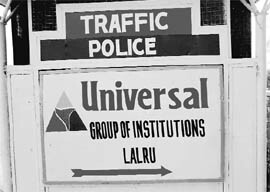 The traffic police here prefers to display advertisements of private institutions on its boards over traffic rules. 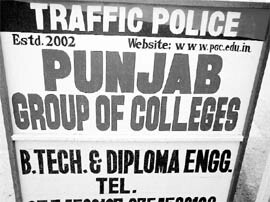 During a visit at Lalru, Dappar Lehli and Zirakpur it was found that at many key crossings on the national highway, private colleges have put up their advertisements on the barricades of the traffic police. DSP (traffic police) Darshan Singh Maan admitted that according to law advertising on traffic police barricades was not permitted. He assured that such barricades would be removed immediately. Residents of this area say they hardly find any traffic rule on these boards as they are covered with advertisements of private institutions. After conducting an inquiry it was found out that these advertising barricades had been set up by private institutions with the consent of some traffic police personnel. Hundreds of tourists and daily commuters had a harrowing time today due to traffic disruption on the National Highway-22. Traffic chaos on the Chandigarh-Shimla Highway, which passes through Kalka, Pinjore, has become a routine affair for commuters and tourists. Long queues were seen up to Kalka-Pinjore level crossing this afternoon. Hundreds of tourists and daily commuters remained stranded in the traffic jam. Residents of Kalka, Pinjore said toll tax at the Kalka-Parwanoo barrier also caused traffic hazard from Gandhi Chowk to Parwanoo barrier. Long queues of vehicles were seen through out the day causing traffic disruption. Residents further said a ray of hope had aroused among them as the construction work of the Pinjore-Kalka-Parwanoo bypass was expected to be completed in September, which would ease out traffic problem. But now the construction work has been delayed by six months due the construction of two more flyovers, opposite HMT factory main gate, and near Burajkotian link road near Chandimandir stone crusher zone. Subsequently, daily commuters would have to face traffic problem in Kalka and Pinjore for next six months. Residents also urged the Kalka police administration to deploy adequate police personnel at Gandhi Chowk, Kalka T-point, to regulate traffic. According to a survey, more than 30,000 vehicles that pass the NH-22 daily would have to face inconvenience during the closure of the Kalka-Pinjore level crossing. Residents of Kalka and Pinjore, including daily commuters have urged the government to intensify the construction work of bypass. Nirmal Kishore, a 52-year-old resident of Sector 38, was found dead in Patiala Ki Rao rivulet, near Dhanas village, here yesterday. The police said a passerby spotted the body and informed the police control room around 11.45 am. The deceased’s wife, Jyoti, who works as a peon in Panjab University, identified the body. Police station-11 inspector Sukhbir Rana ruled out the possibility of foul play behind the death, saying no visible injury marks were found on the body. Jyoti told the police that her husband was a drunkard and had left home without informing anyone. The police believed that Nirmal might have fallen accidentally off the bridge into the rivulet and died. He is survived by his wife and two married children. The police has booked four persons, including two Chandigarh residents, on a charge of duping three persons of Rs 6 lakh on the pretext of sending them abroad. According to the police, Kewal Singh of Panesar village falling in Hoshiarpur district had complained that Harmintar Kumar, his wife Zeenat, both residents of Sector 42, Chandigarh, Ashok Kumar, a resident of Palijhigi village, Nawanshahr, and Rajesh Kumar, alias, Bobby, a resident of Salamabad village, Nawanshahr, had taken Rs 6 lakh on the pretext of sending some persons abroad. However, neither they sent the persons abroad and nor they returned the money, the complainant said. He said he had talked to the accused on April 24, 2009, for sending his relatives - Sandeep Singh, Vijay Kumar and Ajmer Singh - to Hong Kong. A deal was struck for Rs 9 lakh. On April 25, passports and Rs 6 lakh were given to the accused near the milk plant in Phase VI, Mohali, but no arrangements were made to send them abroad and neither was the money returned, the complainant alleged. The matter was investigated by the economic offences wing and later taking opinion of the DA (legal), a case was registered under Sections 420 and 120-B of the IPC against the accused. The police today booked one person for abducting a minor girl from Zirakpur. The accused has been identified as Hari Har, a resident of Bihar. The complainant, Phuldev Patel, a resident of Pabhat village, told the police that when he went for work, his daughter was alone at home. The accused lured his daughter for marriage and took her away from home, he alleged. The accused is still absconding, the police said. A case has been registered. Jalandhar emerged champions in the U-19 Inter-District Cricket Tournament for Dhruv Pandove Trophy by thrashing Patiala by an innings and 147 runs on the final day of the match at Burlton Park, Jalandhar. After declaring the innings on 545 for 6, for hosts, Pargat Singh made his presence felt on the ground, when he took two early wickets of Vikramdit (9) and Anmolpreet (1) on the total of 21 runs. The visitors continued to toil hard to face the bowlers. Patiala at one stage was on 124 for 7. Karan Kaila contributed 48 runs. For the visitors, Amaninder Singh and Bhavish Goel made 80 runs for the eighth wicket to reduce the margin. Wicket keeper Mandeep Jr stumped Goel off the bowling of Siddharth. Goel contributed 29 runs to the total. After the wicket of Goel, Akash caught Amaninder Singh on 59 runs with 11 hits to the fence. Patiala team were all out on 222 in 70.3 overs. Off spinner Pargat Singh was the pick of the bowlers, who scalped five for 44. Gurkirat Singh caught attention with 3 for 55. Rakesh Rathore, Mayor, Jalandhar, awarded a cash prize of Rs 60,000 to Jalandhar team and Rs 30,000 to the runners-up. Patiala (first innings): 176 all out; Jalandhar (first innings): 545 for 6 in 160 overs (declared): Patiala (second innings): 222 all out in 70.3 overs (Amaninder Singh 59, Karan Kaila 48, Bhavish Goel 29, Pargat Singh 5 for 44 and Gurkirat Singh 3 for 55). Stepping Stones Cricket Academy defeated DP Azad Cricket Academy by five wickets in the final of Stepping Stones Cricket Trophy on the school ground here today. Batting first, DPACA were all out in 33.5 overs. Akash remained the top scorer with 90 runs, whereas Bhupinder contributed 17 runs to the total. Chasing the target, openers Hardik Chaudhry (46) and Nikhil (18) built a strong 61-run partnership in just nine overs. The noticeable partnership of of 73 runs between Deepanshu and Abhijot helped the hosts achieve the target Akash was declared the best batsman, while Rishabh and Hardik Chaudhry were declared best bowler and best allrounder of the tournament, respectively. DPACA: 152 all out in 33.5 overs (Akash 90, Bhupinder 17 Abhijot 2 for 31, Rishabh 2 for 32 and Aditya 1 for 21). Stepping Stones:154 for 5 in 34.3 overs (Hardik 46, Nikhil 18, Abhijot 37 n.o, Deepanshu 35 n.o and Arjun Aggarwal 2 for 21). A fine batting by Prabhjot Singh (94 not out) helped BECC, Patiala, defeat Sunny Cricket Club, Bathinda, by eight wickets during the five limited over match series for Friendship Cup on the hosts ground today. With this, BECC has gained 3-1 lead over Sunny Club and won the cup. Winning the toss, Bathinda captain elected to bat first. It scored 172 runs for the loss of five wickets in 35 overs. Dalip played a super knock of 61 runs. He was well supported by Mohit 38. BECC started their innings on a bad note, as they lost their opener Pyush Run. A second wicket partnership for 153 runs between Prabjot and Abhinav helped BECC achieve the target in 34.2 overs. Last and final match will be held tomorrow. Sunny Cricket Club (Bathinda): 172 for 5 in 35 overs (Dalip 61, Mohit 38, Navi 21, Probjot 2 for 24, Vishwajeet 1 for 21 and Navandu Sharma 1 for 43). Black Elephant Cricket Club (Patiala): 173 for 2 in 29.2 overs (Prabjot 94 not out, Abhinav Mehta 50 and Inder 16 not out). New Angel Public School, Zirakpur, organised a three-day Summer Cup National Tae kwon do Championship on the school premises here today. Fifteen teams are participating in the meet. Jaswant Singh Saini, president of school, and Ajit Singh Saini from Kolkata, inaugurated the tournament.